Traditions similar to the modern custom of trick-or-treating extend all the way back to classical antiquity, although it is extremely unlikely that any of them are directly related to the modern custom. The ancient Greek writer Athenaeus of Naucratis records in his book The Deipnosophists that, in ancient times, the Greek island of Rhodes had a custom in which children would go from door-to-door dressed as swallows, singing a song, which demanded the owners of the house to give them food and threatened to cause mischief if the owners of the house refused. This tradition was claimed to have been started by the Rhodian lawgiver Cleobulus. Since the Middle Ages, a tradition of mumming on a certain holiday has existed in parts of Britain and Ireland. It involved going door-to-door in costume, performing short scenes or parts of plays in exchange for food or drink. The custom of trick-or-treating on Halloween may come from the belief that supernatural beings, or the souls of the dead, roamed the earth at this time and needed to be appeased. It may otherwise have originated in a Celtic festival, held on 31 October–1 November, to mark the beginning of winter. It was Samhain in Ireland, Scotland and the Isle of Man, and Calan Gaeaf in Wales, Cornwall, and Brittany. The festival is believed to have pre-Christian roots. In the 9th century, the Catholic Church made 1 November All Saints' Day. Among Celtic-speaking peoples, it was seen as a liminal time, when the spirits or fairies (the Aos Sí), and the souls of the dead, came into our world and were appeased with offerings of food and drink. Similar beliefs and customs were found in other parts of Europe. It is suggested that trick-or-treating evolved from a tradition whereby people impersonated the spirits, or the souls of the dead, and received offerings on their behalf. S. V. Peddle suggests they "personify the old spirits of the winter, who demanded reward in exchange for good fortune". Impersonating these spirits or souls was also believed to protect oneself from them. At least as far back as the 15th century, among Christians, there had been a custom of sharing soul-cakes at Allhallowtide (October 31 through November 2). People would visit houses and take soul-cakes, either as representatives of the dead, or in return for praying for their souls. Later, people went "from parish to parish at Halloween, begging soul-cakes by singing under the windows some such verse as this: 'Soul, souls, for a soul-cake; Pray you good mistress, a soul-cake!'" They typically asked for "mercy on all Christian souls for a soul-cake". It was known as 'Souling' and was recorded in parts of Britain, Flanders, southern Germany, and Austria. Shakespeare mentions the practice in his comedy The Two Gentlemen of Verona (1593), when Speed accuses his master of "puling [whimpering or whining] like a beggar at Hallowmas". The wearing of costumes, or "guising", at Hallowmas, had been recorded in Scotland in the 16th century and was later recorded in other parts of Britain and Ireland. There are many references to mumming, guising or souling at Halloween in Britain and Ireland during the late 18th century and the 19th century. In parts of southern Ireland, a man dressed as a Láir Bhán (white mare) led youths house to house reciting verses—some of which had pagan overtones—in exchange for food. If the household donated food it could expect good fortune from the 'Muck Olla', but if they refused to do so, it would bring misfortune. In Scotland, youths went house to house in white with masked, painted or blackened faces, reciting rhymes and often threatening to do mischief if they were not welcomed. In parts of Wales, peasant men went house to house dressed as fearsome beings called gwrachod, or presenting themselves as the cenhadon y meirw (representatives of the dead). In western England, mostly in the counties bordering Wales, souling was common. According to one 19th century English writer "parties of children, dressed up in fantastic costume […] went round to the farm houses and cottages, signing a song, and begging for cakes (spoken of as "soal-cakes"), apples, money, or anything that the goodwives would give them". Guising at Halloween in Scotland is recorded in 1895, where masqueraders in disguise carrying lanterns made out of scooped out turnips, visit homes to be rewarded with cakes, fruit, and money. The practice of guising at Halloween in North America is first recorded in 1911, where a newspaper in Kingston, Ontario, Canada reported children going "guising" around the neighborhood. American historian and author Ruth Edna Kelley of Massachusetts wrote the first book length history of the holiday in the US; The Book of Hallowe'en (1919), and references souling in the chapter "Hallowe'en in America"; "The taste in Hallowe'en festivities now is to study old traditions, and hold a Scotch party, using Burn's poem Hallowe'en as a guide; or to go a-souling as the English used. In short, no custom that was once honored at Hallowe'en is out of fashion now." Kelley lived in Lynn, Massachusetts, a town with 4,500 Irish immigrants, 1,900 English immigrants, and 700 Scottish immigrants in 1920. In her book, Kelley touches on customs that arrived from across the Atlantic; "Americans have fostered them, and are making this an occasion something like what it must have been in its best days overseas. All Hallowe'en customs in the United States are borrowed directly or adapted from those of other countries". While the first reference to "guising" in North America occurs in 1911, another reference to ritual begging on Halloween appears, place unknown, in 1915, with a third reference in Chicago in 1920. The thousands of Halloween postcards produced between the start of the 20th century and the 1920s commonly show children but do not depict trick-or-treating. The editor of a collection of over 3,000 vintage Halloween postcards writes, "There are cards which mention the custom [of trick-or-treating] or show children in costumes at the doors, but as far as we can tell they were printed later than the 1920s and more than likely even the 1930s. Tricksters of various sorts are shown on the early postcards, but not the means of appeasing them". Trick-or-treating does not seem to have become a widespread practice until the 1930s, with the first U.S. appearances of the term in 1934, and the first use in a national publication occurring in 1939. Behavior similar to trick-or-treating was more commonly associated with Thanksgiving from 1870 (shortly after that holiday's formalization) until the 1930s. In New York City, a Thanksgiving ritual known as Ragamuffin Day involved children dressing up as beggars and asking for treats, which later evolved into dressing up in more diverse costumes. Increasing hostility toward the practice in the 1930s eventually led to the begging aspects being dropped, and by the 1950s, the tradition as a whole had ceased. Almost all pre-1940 uses of the term "trick-or-treat" are from the United States and Canada. Trick-or-treating spread throughout the United States, stalled only by sugar rationing that began in April 1942 during World War II and did not end until June 1947. Early national attention to trick-or-treating was given in October 1947 issues of the children's magazines Jack and Jill and Children's Activities, and by Halloween episodes of the network radio programs The Baby Snooks Show in 1946 and The Jack Benny Show and The Adventures of Ozzie and Harriet in 1948. Trick-or-treating was depicted in the Peanuts comic strip in 1951. The custom had become firmly established in popular culture by 1952, when Walt Disney portrayed it in the cartoon Trick or Treat, and Ozzie and Harriet were besieged by trick-or-treaters on an episode of their television show. In 1953 UNICEF first conducted a national campaign for children to raise funds for the charity while trick-or-treating. Although some popular histories of Halloween have characterized trick-or-treating as an adult invention to re-channel Halloween activities away from Mischief Night vandalism, there are very few records supporting this. Des Moines, Iowa is the only area known to have a record of trick-or-treating being used to deter crime. Elsewhere, adults, as reported in newspapers from the mid-1930s to the mid-1950s, typically saw it as a form of extortion, with reactions ranging from bemused indulgence to anger. Likewise, as portrayed on radio shows, children would have to explain what trick-or-treating was to puzzled adults, and not the other way around. Sometimes even the children protested: for Halloween 1948, members of the Madison Square Boys Club in New York City carried a parade banner that read "American Boys Don't Beg." The National Confectioners Association reported in 2005 that 80 percent of adults in the United States planned to give out confectionery to trick-or-treaters, and that 93 percent of children, teenagers, and young adults planned to go trick-or-treating or participating in other Halloween activities. Despite the concept of trick-or-treating originating in Britain and Ireland in the form of souling and guising, the use of the term "trick or treat" at the doors of homeowners was not common until the 1980s. Guising requires those going door-to-door to perform a song or poem without any jocular threat, and according to one BBC journalist, in the 1980s, "trick or treat" was still often viewed as an exotic and not particularly welcome import, with the BBC referring to it as "the Japanese knotweed of festivals" and "making demands with menaces". In Ireland before the phrase "trick or treat" became common, children would say "Help the Halloween Party". Very often, the phrase "trick or treat" is simply said and the revellers are given sweets, with the choice of a trick or a treat having been discarded. Trick-or-treating typically happens between 5:30pm and 9:30pm on October 31, although some municipalities choose other dates. Homeowners wishing to participate sometimes decorate their homes with artificial spider webs, plastic skeletons and jack-o-lanterns. While not every residence may be decorated for the holiday, those participating in the handing out of candy will opt to leave a porch light on to signify that the opportunity for candy is available. Some homeowners may go as far as asking trick-or-treaters for a "trick" before providing them with candy, while others simply leave the candy in bowls on the porch. In more recent years,[when?] participation has spread through whole neighborhoods, with children even visiting senior residences and condominiums. Halloween shop in Derry, Northern Ireland. Halloween masks are called ‘false faces’ in Ireland. In Scotland and Ireland, "guising" — children going from door to door in disguise — is traditional, and a gift in the form of food, coins or "apples or nuts for the Halloween party" (in more recent times chocolate) is given out to the children. The tradition is called "guising" because of the disguises or costumes worn by the children. In the West Mid Scots dialect, guising is known as "galoshans". Halloween masks are referred to as ‘false faces’ in Ireland. While guising has been recorded in Scotland in the 16th century, a more contemporary record of guising at Halloween in Scotland is in 1895, where masqueraders in disguise carrying lanterns made out of scooped out turnips, visit homes to be rewarded with cakes, fruit, and money. Guising also involved going to wealthy homes, and in the 1920s, boys went guising at Halloween up to the affluent Thorntonhall, South Lanarkshire. An account of guising in the 1950s in Ardrossan, North Ayrshire, records a child receiving 12 shillings and sixpence, having knocked on doors throughout the neighborhood and performed. Growing up in Derry, Northern Ireland in the 1960s, Michael Bradley recalls kids wearing their masks and costumes to go knocking on doors asking, “Any nuts or apples?”. There is a significant difference from the way the practice has developed in North America with the jocular threat. In Scotland and Ireland, the children are only supposed to receive treats if they perform a party trick for the households they go to. This normally takes the form of singing a song or reciting a joke or a funny poem which the child has memorised before setting out. Occasionally a more talented child may do card tricks, play the mouth organ, or something even more impressive, but most children will earn plenty of treats even with something very simple. Often they won't even need to perform. While going from door to door in disguise has remained popular among Scots and Irish at Halloween, the North American saying "trick-or-treat" has become common. 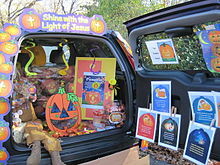 Some organizations around the United States and Canada sponsor a "Trunk-or-Treat" on Halloween night (or on occasion, a day immediately preceding Halloween), where trick-or-treating is done from parked car to parked car in a local parking lot, often at a school or church. This annual event began in the mid-1990s as a "Fall Festival" for an alternative to trick-or-treating, but became "Trunk-or-Treat" two decades later. The activity involves the open trunk of a car, displaying candy, and often games and decorations. Some parents regard trunk-or-treating as a safer alternative to trick-or-treating; while other parents see it as an easier alternative to walking the neighborhood with their children. Some have called for more city or community group-sponsored Trunk-or-Treats, so they can be more inclusive. These have become increasingly popular in recent years. Children of the St. Louis, Missouri area are expected to perform a joke, usually a simple Halloween-themed pun or riddle, before receiving any candy; this "trick" earns the "treat". Children in Des Moines, Iowa also tell jokes or otherwise perform before receiving their treat. In most areas where trick-or-treating is practiced, it is strictly meant for children. In fact, there are a diversity of opinions regarding when to end trick or treating, the most restrictive of which is age 12, the least restrictive at any age, and a common rule of thumb being "if you are old enough to drive a car you are too old to beg strangers for candy". In both countries, it is expected that a teenager will transition into more mature expressions of celebrating the holiday, such as fancy dress, games, and diversions like bonfires and bobbing for apples, and sweets like caramel apples, and teenagers will often attend school or community events with a Halloween theme where there will be dancing and music. In some parts of Canada, children sometimes say "Halloween apples" instead of "trick or treat". This probably originated when the toffee apple was a popular type of candy. Apple-giving in much of Canada, however, has been taboo since the 1960s when stories (of almost certainly questionable authenticity) appeared of razors hidden inside Halloween apples; parents began to check over their children's "loot" for safety before allowing them to eat it. 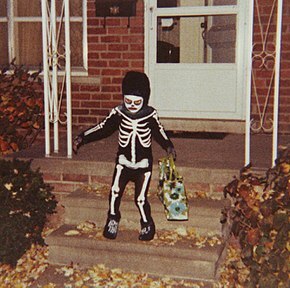 In Quebec, children also go door to door on Halloween. However, in French-speaking neighbourhoods, instead of "Trick or treat", they will simply say "Halloween", though it traditionally used to be "La charité, s'il-vous-plaît" ("Charity, please"). In Portugal, children go from house to house in All Saints day and All Souls Day, carrying pumpkin carved lanterns called coca, asking every one they see for Pão-por-Deus singing rhymes where they remind people why they are begging, saying "...It is for me and for you, and to give to the deceased who are dead and buried[...]" or "[...]It is to share with your deceased [...]" If a door is not open or the children don't get anything, they end their singing saying "[...]In this house smells like lard, here must live someone deceased". In the Azores the bread given to the children takes the shape of the top of a skull. The tradition of pão-por-Deus was already recorded in the 15th century. After this ritual begging, takes place the Magusto and big bonfires are lit with the "firewood of the souls". The young people play around smothering their faces with the ashes. The ritual begging for the deceased used to take place all over the year as in several regions the dead, those who were dear, were expected to arrive and take part in the major celebrations like Christmas and a plate with food or a seat at the table was always left for them. In Sweden, children dress up as witches and monsters when they go trick-or-treating on Maundy Thursday (the Thursday before Easter) while Danish children dress up in various attires and go trick-or-treating on Fastelavn (or the next day, Shrove Monday). In Norway, "trick-or-treat" is called "knask eller knep", which means almost the same thing, although with the word order reversed, and the practice is quite common among children, who come dressed up to people's doors asking for, mainly, candy. Many Norwegians prepare for the event by consciously buying a small stock of sweets prior to it, to come in handy should any kids come knocking on the door, which is very probable in most areas. The Easter witch tradition is done on Palm Sunday in Finland (virvonta). In parts of Flanders and some parts of the Netherlands and most areas of Germany, Switzerland, and Austria, children go to houses with homemade beet lanterns or with paper lanterns (which can hold a candle or electronic light), singing songs about St. Martin on St. Martin's Day (the 11th of November), in return for treats. In Northern Germany and Southern Denmark, children dress up in costumes and go trick-or-treating on New Year's Eve in a tradition called "Rummelpott [de]". UNICEF started a program in 1950 called Trick-or-Treat for UNICEF in which trick-or-treaters ask people to give money for the organization, usually instead of collecting candy. Participating trick-or-treaters say when they knock at doors "Trick-or-treat for UNICEF!" This program started as an alternative to candy. The organization has long produced disposable collection boxes that state on the back what the money can be used for in developing countries. ^ Roger, Tricking (2003). Halloween: From Pagan Ritual to Party Night. Oxford University Press. pp. 28–30. ISBN 0-19-514691-3. ^ Turner, Angela (2015). Swallow. London, England: Reaktion Books Ltd. p. unpaginated. ISBN 9781780235592. ^ Mathiesen, Thomas J. (1999). Apollo's Lyre: Greek Music and Music Theory in Antiquity and the Middle Ages. Lincoln, Nebraska: University of Nebraska Press. p. 156. ISBN 978-1597407960. ^ Dalby, Andrew (1998). "Homer's Enemies: Lyric and Epic in the Seventh Century". In Fisher, Nick; van Wees, Hans (eds.). Archaic Greece: New Approaches and New Evidence. London, England: General Duckworth & Co. Ltd. p. 204. ISBN 978-1-910589-58-8. ^ Miles, Clement A. (1912). Christmas in Ritual and Tradition. Chapter 7: All Hallow Tide to Martinmas. ^ The Two Gentlemen of Verona. Act 2, Scene 1. ^ Arnold, Bettina (2001-10-31). "Halloween Customs in the Celtic World". University of Wisconsin-Milwaukee. Archived from the original on 2011-06-24. Retrieved 2007-10-16. ^ a b Frank Leslie's popular monthly, Volume 40, November 1895, p. 540-543. Books.google.com. Retrieved 2012-10-10. ^ Kelley, Ruth Edna Kelley. The Book of Hallowe'en, Boston: Lothrop, Lee and Shepard Co., 1919, chapter 15, p.127. "Hallowe'en in America." ^ U.S. Census, January 1, 1920, State of Massachusetts, City of Lynn. ^ Wright, Theo. E., "A Halloween Story," St. Nicholas, October 1915, p. 1144. Mae McGuire Telford, "What Shall We Do Halloween?" Ladies Home Journal, October 1920, p. 135. ^ "'Trick or Treat' Is Demand," Herald (Lethbridge, Alberta), November 4, 1927, p. 5, dateline Blackie, Alberta, Canada Nov. 3. ^ For examples, see the websites Postcard & Greeting Card Museum: Halloween Gallery, Antique Hallowe'en Postcards, Vintage Halloween Postcards Archived 2008-07-23 at the Wayback Machine, and Morticia's Morgue Antique Halloween Postcards. ^ E-mail from Louise and Gary Carpentier, 29 May 2007, editors of Halloween Postcards Catalog (CD-ROM), G & L Postcards. Pretty Boy John Doe rang the door bells and his gang waited his signal. It was his plan to proceed cautiously at first and give a citizen every opportunity to comply with his demands before pulling any rough stuff. "Madam, we are here for the usual purpose, 'trick or treat.'" This is the old demand of the little people who go out to have some innocent fun. Many women have some apples, cookies or doughnuts for them, but they call rather early and the "treat" is given out gladly. The Chicago Tribune also mentioned door-to-door begging in Aurora, Illinois on Halloween in 1934, although not by the term "trick-or-treating." "Front Views and Profiles" (column), Chicago Tribune, Nov. 3, 1934, p. 17. ^ Moss, Doris Hudson. "A Victim of the Window-Soaping Brigade?" The American Home, November 1939, p. 48. Moss was a California-based writer. ^ Nigro, Carmen (November 23, 2010). "Thanksgiving Ragamuffin Parade". New York Public Library. Retrieved January 6, 2017. ^ "Ragamuffin Parades Mark Holiday in City" (PDF). The New York Times. November 28, 1947. Retrieved January 6, 2017. ^ Morton, Lisa (2012). Trick or Treat a history of halloween. Reaktion Books. p. 64. ISBN 9781780231877. ^ "One Lump Please", Time, March 30, 1942. "Decontrolled", Time, June 23, 1947. ^ Published in Indianapolis, Indiana and Chicago, Illinois, respectively. ^ The Baby Snooks Show, November 1, 1946, and The Jack Benny Show, October 31, 1948, both originating from NBC Radio City in Hollywood; and The Adventures of Ozzie and Harriet, October 31, 1948, originating from CBS Columbia Square in Hollywood. ^ "Peanuts Comic Strip on GoComics.com". Comics.com. 2000-02-13. Retrieved 2012-10-10. ^ "Halloween Party," The Adventures of Ozzie & Harriet, Oct. 31, 1952. ^ "A Barrel of Fun for Halloween Night," Parents Magazine, October 1953, p. 140. "They're Changing Halloween from a Pest to a Project," The Saturday Evening Post, October 12, 1957, p. 10. ^ ""Des Moines Register Archived 2013-01-21 at Archive.today," Jokes set local Halloween apart , Oct. 2000. In plain fact it is straight New York or Chicago "graft" or "racket" in miniature. Certainly it wouldn't be a good idea for youngsters to go in extensively for this kind of petty "blackmail" on any other date than Halloween. Neither police nor public opinion would stand for that. As a mother of two children I wish to register indignation at the "trick or treat" racket imposed on residents on Hallowe'en night by the youngsters of this city.… This is pure and simple blackmail and it is a sad state of affairs when parents encourage their youngsters to participate in events of this kind. The Commissioners and District of Columbia officials should enact a law to prohibit "beggars night" at Hallowe'en. It is making gangsters of children.… If the parents of these children were fined not less than $25 for putting their children out to beg, they would entertain their children at home. I have lived in some 20 other towns and cities and I never saw nor heard of the begging practice until about 1936.… The sooner it becomes obsolete here the better. I don't mind the tiny children who want to show off their costumes, but I resent the impudence of the older children. Another year has rolled around and the nightmare of having to put up with the "trick or treat" idea again fills me with dread. ^ Recalled a decade later by Martin Tolchin, "Halloween A Challenge To Parents," The New York Times, October 27, 1958, p. 35. ^ Trick-or-treaters can expect Mom or Dad’s favorites in their bags this year, National Confectioners Association, 2005. ^ Fun Facts: Halloween, National Confectioners Association, 2004. ^ Coughlan, Sean. "The Japanese knotweed of festivals", BBC News Magazine, 31 October 2007. ^ Sarah Carpenter (December 2001). "Scottish Guising: Medieval And Modern Theatre Games". International Journal of Scottish Theatre. 2 (2). Retrieved 2008-10-06. ^ Palazzolo, Joe (October 31, 2014). "Did You Hear the One About Frankenstein's Ghoul Friend?". The Wall Street Journal. Retrieved 14 November 2014. ^ "St Martin's Day". H2g2.com. 2007-01-13. Retrieved 2012-10-10. ^ "The history of trick-or-treat for UNICEF". Retrieved 21 September 2017. Wikimedia Commons has media related to Trick-or-treating. Ben Truwe, The Halloween Catalog Collection. Portland, Oregon: Talky Tina Press, 2003. ISBN 0-9703448-5-6.